As of March 31, 2017, Otsego County is home to 2,167 retirees and beneficiaries. You can find numbers for all of New York’s counties on page 29 of the 2017 Comprehensive Annual Financial Report (see URL below). ONLY I WANT TO SAY. I LOVE NEW YORK AND WESTCHESTER HEALTH DEPT. GOD BLESS ALL OF YOU. I wish it were more affordable for retirees in NYS. It is hard to make a decision as a retiree to relocate, where life will be more affordable, or to stay in NY where family and friends are, but the cost is prohibitive. I moved out of state 15 years ago but I could never afford to move back because of the high property taxes and cold winters. 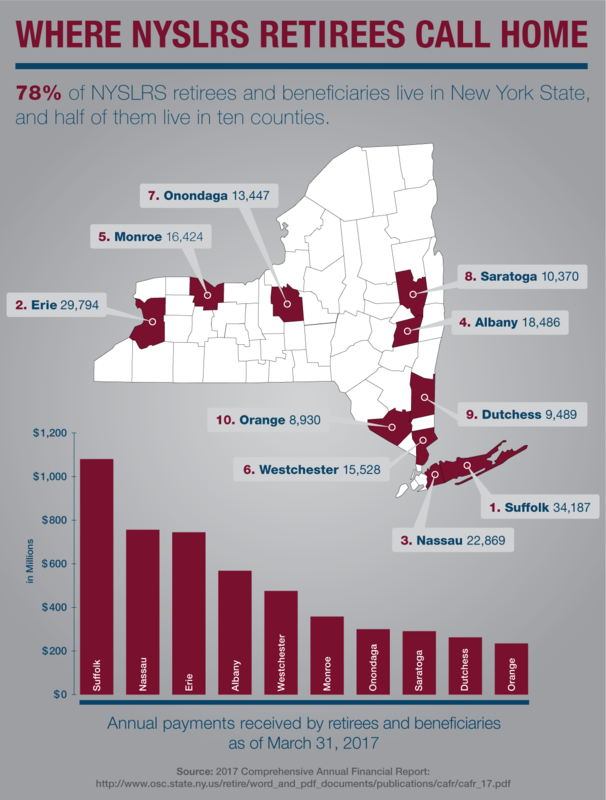 How does residency outside of NYS affect your pension. NYSLRS retirees live all across the United States and around the world. It doesn’t affect their pensions directly. However, a move out of state may have tax implications. While NYSLRS pensions have been (and continue to be) subject to federal income tax, they are not taxed by New York State. If you move out of New York, your pension will be subject to the tax laws of your new home state, and you may have to pay state taxes on your pension. The Retired Public Employees Association tracks which states tax pensions. If you want more information, check out our Taxes and Your Pension page. You may wish consult a tax advisor for details.